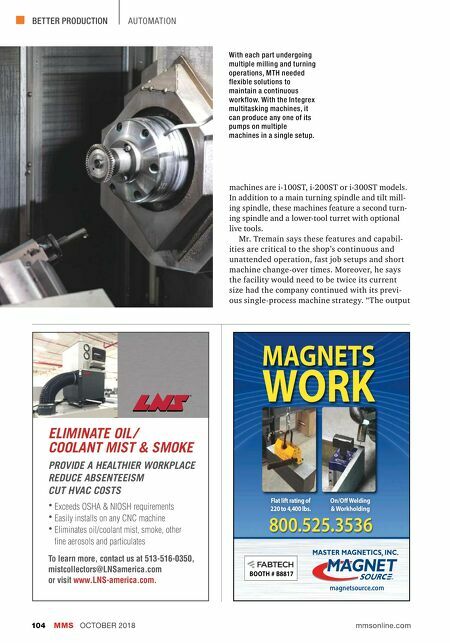 MODERN MACHINE SHOP 105 BETTER PRODUCTION Multitasking Machines we now accomplish with our 12 Mazaks would have required over 30 individual, single-process machines and the hard-to-find machinists to run them," Mr. Tremain says. "We could not have grown to our current level of sales and produc- tion capacity/output without the multitasking machines." Now, each machine can complete a part in a single setup, eliminating WIP. Multitasking Brings Agility, Even in High Production So-called "done-in-one" capability has enabled the shop to increase output with fewer machines and fewer work- ers required on any one job. The reduction in machines, in turn, has boosted cost-effectiveness and helped conserve valuable shopf loor space. Because multi- tasking machines eliminate the need for any in-process work handling, MTH has improved its processing consistency and f lex- ibility as well as in-part concen- tricity and overall accuracy. In fact, when it comes to improved part accuracy and concentric- ity, there are some instances in which the shop has experienced five-fold improvements. Con- centricity between pump com- ponents is critical because all of the parts mount to each other or are stacked together: The more precise each individual compo- nent is, the better the pump's performance. Most parts require face turn- ing that the shop now does using mill-turn operations on its Mazak multitasking machines. According to Mr. Tremain, doing so is not only faster, but the milling tools last significantly longer than the single-point inserts that would ordinarily be used for turning. "With automation, we quickly found out that the cost of perishable tooling just doesn't matter anymore. The only thing that counts is keeping the machine running unat- tended as long as possible," he says. 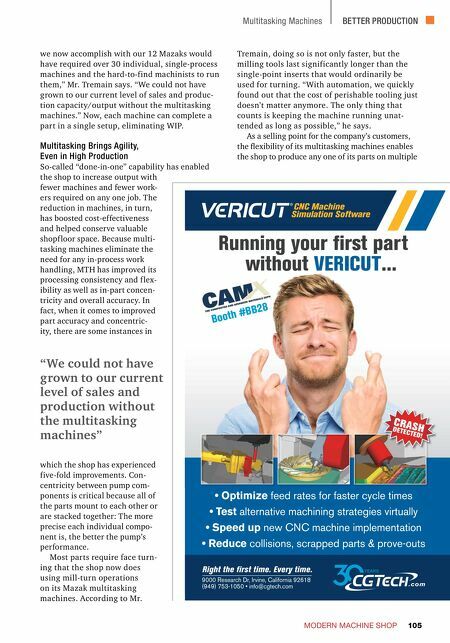 As a selling point for the company's customers, the flexibility of its multitasking machines enables the shop to produce any one of its parts on multiple "We could not have grown to our current level of sales and production without the multitasking machines"